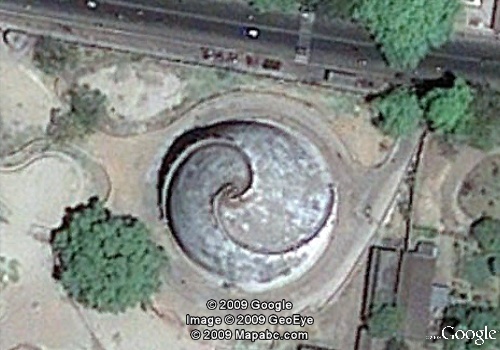 This stupa like building which looks like yin - yang from air is a domed granary built in 1786 by Captain John Garstin, at the order of Warren Hastings, who later became the first Governor-General of India. This huge granary was constructed to cater for the needs of the British army which had faced lot of difficulty due to severe draught and acute famine from 1770 to 1780. 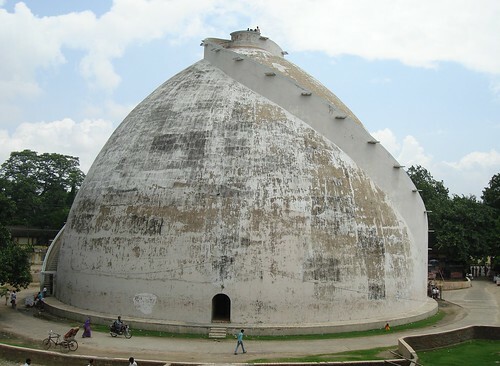 Because of its shape the structure is known as Gol Ghar (Round House). It is pillarless with a base of 125 metres, height 29 metres and a wall of thickness of 3.6 metres at the base. There is an opening at the top for filling the dome with grains. It is provided with two spiral shaped staircases on the outer shell - one for going up and other for coming down - so that the labourers going up with the grain bags are not hindered by those returning from top after emptying their load. 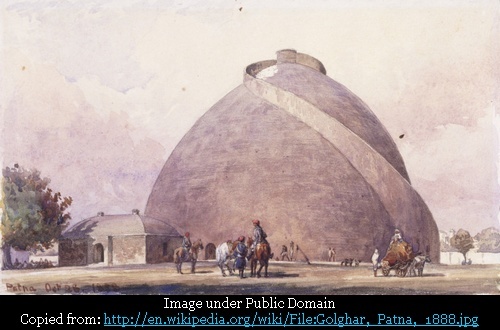 At the time of its construction it was the highest structure in Patna. Sometimes the best designs come to a naught because of some oversight. So was the case with this structure. The designer failed to perceive some proper way to take out the grain from the granary. The doors at the bottom were designed to open inwards with the result that as soon as some grain was poured in the doors won't move and it was impractical to remove the grains from the opening at top. The structure was therefore abandoned with its doors and the hole at the top sealed and it came to be known as "Garstin’s Folly". With passage of time it fell into decay but was later renovated and is a tourist spot now which provides a great panoramic view of the city and the river Ganges flowing nearby. If time allows i plan to visit this spectacle? How on earth did he put he door inward opening? Perhaps too much alcohol in the officers mess ? I think you meant 'descendent' and not 'ancestor'. Looks like a typo error. If you visit the Folly, do take some picture. I will include it here. In case you are planning to visit Lucknow, you can contact me by e-mail. I will be happy to meet you.